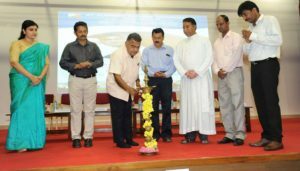 The University Grants Commission (UGC) has launched a scheme on skills development based higher education as part of college/university education, leading to Bachelor of Vocation (B.Voc.). 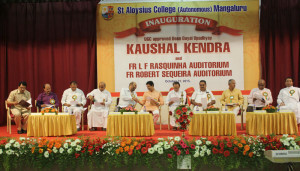 St. Aloysius College was awarded this status of Prestigious Kaushal Kendra by UGC to run three B.Voc. Courses such as Retail Management, Food Processing and Engineering and Pharmaceutical Chemistry from the academic year 2015-2016. The B.Voc. programme is focused on universities and colleges providing undergraduate studies which would also incorporate specific job roles along with broad based general education. This would enable the graduates completing B.Voc.to make a meaningful participation in accelerating India’s economy by gaining appropriate employment, becoming entrepreneurs and creating appropriate knowledge. It is a degree course with multiple exit and entry points such as certificate, Diploma, Advanced Diploma and Bachelors of Vocation. The Course has 4 stages with 6 semesters. Further they also become eligible to pursue postgraduate studies and research like M.Voc. Equipping students with knowledge, practice, & necessary job oriented skills enabling them to gain suitable employment, Curriculum collaborated with the industry requirements, Credit based Semester system, Exposure to real time application development at the end of each semester except first semester, Certification of skill component by NSDC and various Sector Skill Council, Collaborations with Industries for training and placements. With the tremendous growth of the economy, retail management has emerged as one of the fastest growing careers in India. The enormous expansion of the sector has thrown up a big demand for skilled professionals in the field. Job prospects in the retail sector include but are not limited to Customer Sales Associate, Department Manager, Floor Manager, Store Manager, Retail Operations Manager, Retail Buyers and Merchandisers, Visual Merchandisers, Logistic Managers, Warehouse Managers and many more. Retail Management Semester I - Communication skills-I, Hindi (opt), Kannada (opt), Basic Computer Skills -I, Introduction to Retailing, Elements of salesmanship, Principles of Management, Fundamentals of customer service, Store Operations-1, Project Work on Elements of Salesmanship. Retail Management Semester II - Communication skills-II, Hindi (opt), Kannada (opt), Basic Computer Skills -II, Stores Layout and Design, Business Organization and Environment, Brand Management and consumer Marketing, Human Resource Management and industrial relation, Store operations-2, Project Work on Stores Layout and Design. Retail Management Semester III - Soft skills, Health safety and environment, Fundamentals of Indian constitution, Retail management-Functional Principles and Practices, Advertisement sales and promotion, visual merchandising, Marketing for services, Store operations-3, Project Work on Visual Merchandising. Retail Management Semester IV - Behavioral skills, Human rights &value education, Taxation law & practice in business, Accounting Fundamentals, Retail consumer behavior, Retail supply chain management, Mall management, Store operations-4, Project Work on Mall management. Food processing is a contemporary exercise that develops efficiency and improves promotion of the food products. This course is based on developing set of methods and techniques which can be used to transform raw materials into nutritious and safe food for consumption. It offers exponential career opportunities to trained professionals in food processing. The curriculum has been designed to include general education and skill development components, having extensive practical and on job trainings along with regular industrial visits so that they can be easily absorbed in Food Industry or become Entrepreneurs. Food Processing & Engineering Semester I - Communication Skills – I, Kannada (opt), Hindi (opt), Basic computer skills – I, Basics of Food Processing, Fundamentals of Food and Nutrition, Basics of Food Safety and Regulatory Act, Practical Basics of Food Processing, Practical Fundamentals of Food and Nutrition, Practical Basics of Food Safety and Regulatory Act, Industrial Visit. Food Processing & Engineering Semester II - Communication Skills – II, Kannada (opt), Hindi (opt), Basic computer skills – II, Introduction to Cereals, Legumes and Oil Processing, Fundamentals of Food Chemistry and Microbiology, Introduction to Fruit and Vegetable Processing, Practical Introduction to Cereals, Legumes and Oil Processing, Practical Fundamentals of Food Chemistry and Microbiology, Practical Introduction to Fruit and Vegetable Processing, Industrial Visit. 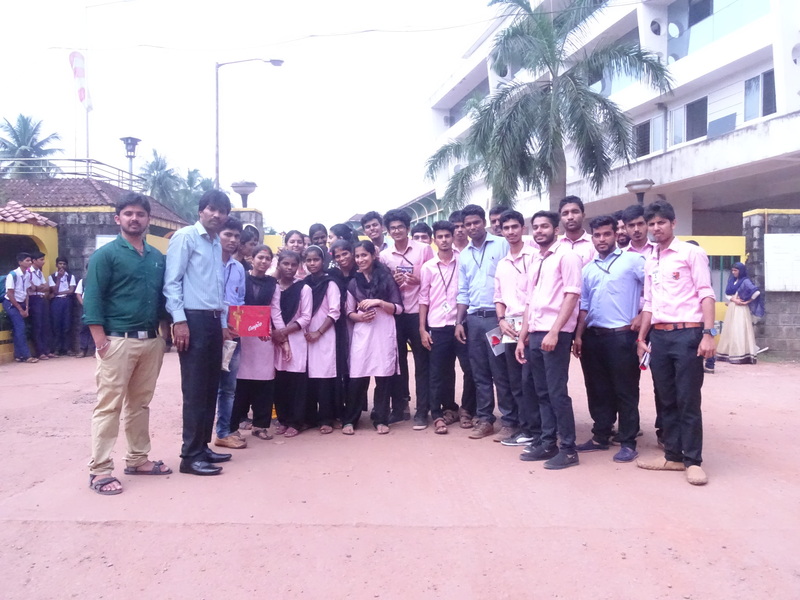 Food Processing & Engineering Semester III - Soft skills, Health safety and environment, Fundamentals of Indian constitution, Introduction to Bakery & Confectionery Processing, Food Engineering and Instrumentation, Introduction to Dairy Technology, Practical Introduction to Bakery & Confectionery Processing, Practical Food Engineering and Instrumentation, Practical Introduction to Dairy Technology, Industrial Visit. Food Processing & Engineering Semester IV - Behavioral skills, Human Rights and Value Education, Fundamentals of Business Law, Introduction to Meat, Fish and Poultry Processing, Basics of Food Packaging, Food Additives and Preservatives, Practical Introduction to Meat, Fish and Poultry Processing, Practical Basics of Food Packaging, Practical Food Additives and Preservatives, Industrial Visit. Food Processing & Engineering Semester V - Gender Equity and Value Education, Legal and ethical aspects of Business, Entrepreneurship, Food Drying and Concentration Techniques, Spices and Plantation Crop Technology, Introduction to Fermentation Technology, Practical Food Drying and Concentration Techniques, Practical Spices and Plantation Crop Technology, Practical Introduction to Fermentation Technology, Industrial Visit. Food Processing & Engineering Semester VI - General Project Management, Inventory Management, Principles of Marketing, Food Industry Waste Management, Practical Food Industry Waste Management, Industrial Project. The program is designed to educate and create skilled manpower that can serve the society through the knowledge gained during the course of time. The student enrolling in the course will be benefitted in several ways. If a candidate successfully completes first year of study he would be awarded a diploma and he will be capable enough to serve as a laboratory assistant in any industry or academic institution. A candidate completing two successful years in Bachelor of Vocation program will be awarded with advanced diploma. An advanced diploma qualified student in Pharmaceutical Chemistry will be fit for working in ADL, QC and Production department of any pharmaceutical industries. The candidate completing all three years of the course successfully will be awarded with Bachelor of Vocation in Pharmaceutical Chemistry and is fit for getting absorbed in any division of Pharmaceutical Industries. Pharmaceutical Chemistry Semester I - Communication Skills – I, , Kannada (opt), Hindi (opt), Basic computer skills – I, Pharmaceutics (Basic Principles), Basic Organic Chemistry, Practical-Organic chemistry-I, Practical - Inorganic chemistry, Practical – Organic chemistry-II. Pharmaceutical Chemistry Semester II - Communication Skills – II, Kannada (opt), Hindi (opt), Basic computer skills – II, Pharmaceutical Inorganic chemistry, Fundamental Biochemistry, Indian Drugs Regulatory and GMP, Practical-Inorganic chemistry-I, Practical–Analytical chemistry, Practical–Inorganic chemistry-II. Pharmaceutical Chemistry Semester III - Soft skills, Health safety and Environment, Fundamentals of Indian constitution, Basic physical chemistry, Cell biology, Analytical chemistry, Practical– Physical chemistry, Practical- Analytical chemistry, Practical- Cell biology. Pharmaceutical Chemistry Semester IV - Behavioral skills, Human Rights and Value Education, Fundamentals of Business Law, Medicinal chemistry-I, Basic Microbiology, Advanced Analytical chemistry-I, Practical-Medicinal chemistry, Practical-Analytical chemistry, Practical- Basic microbiology. 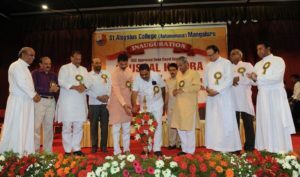 St. Aloysius College was awarded this status of Prestigious Kaushal Kendra by UGC in 2016. UGC has approved to run "Animation & Multimedia" Course in B.Voc from the academic year 2018-19. Only limited seats are available.